Ditch the fancy schmancy icing and reach for a bag of mini marshmallows. 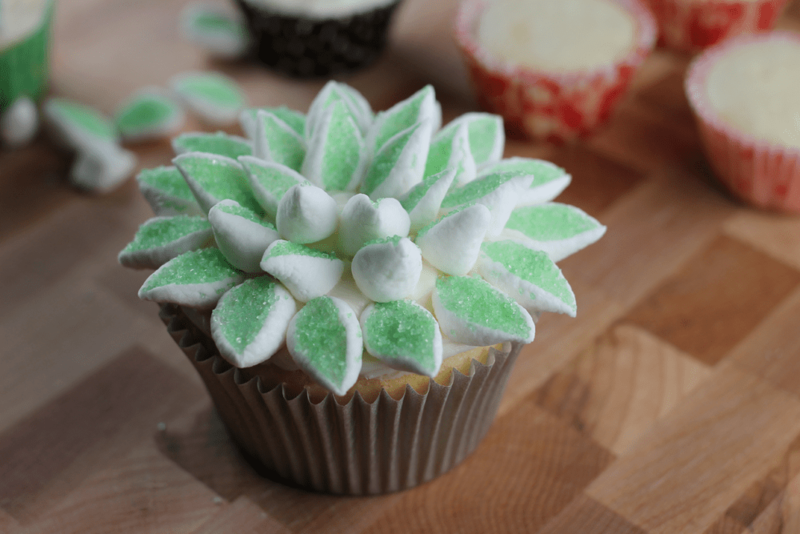 Who would have guessed mini marshmallows could look so impressive on a cupcake? But I’m getting ahead of myself here. Gotta make the coconut cupcakes first! For a change I went semi-homemade on this one. I started with a box of store bought white cake and mixed it as directed. 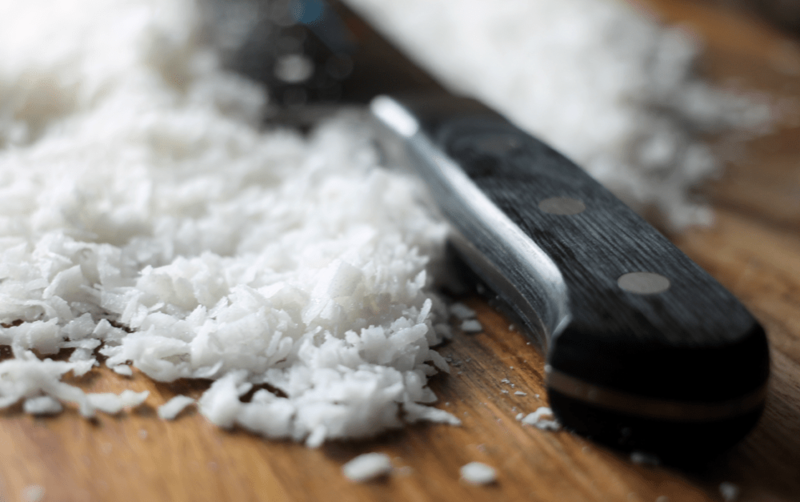 White cake is SO BORING, so add in three teaspoons of coconut extract and 1 1/2 cups of chopped sweetened flaked coconut. Trust me, this is going to be super delicious and no one will know you took a shortcut. Line a cupcake pan with cupcake liners, fill them 1/2 – 2/3 full with cake batter, and bake as directed. 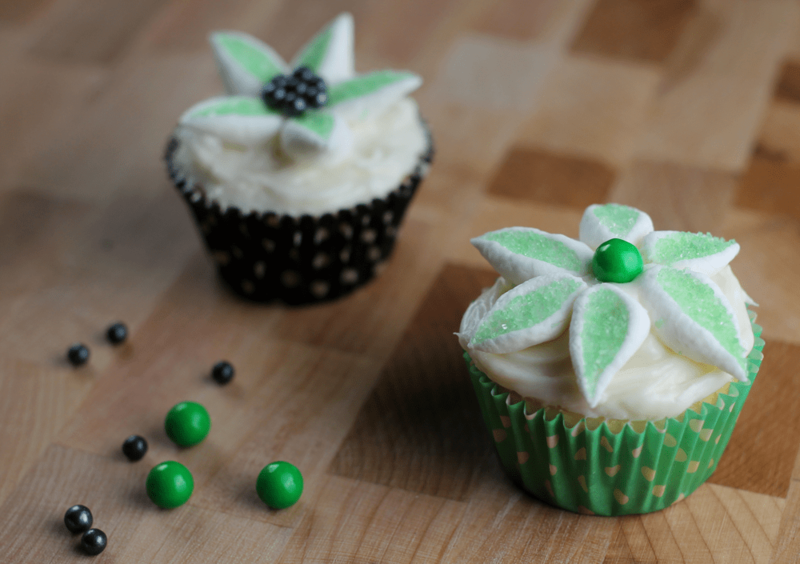 Mini or regular sized cupcakes will work for this baking project. 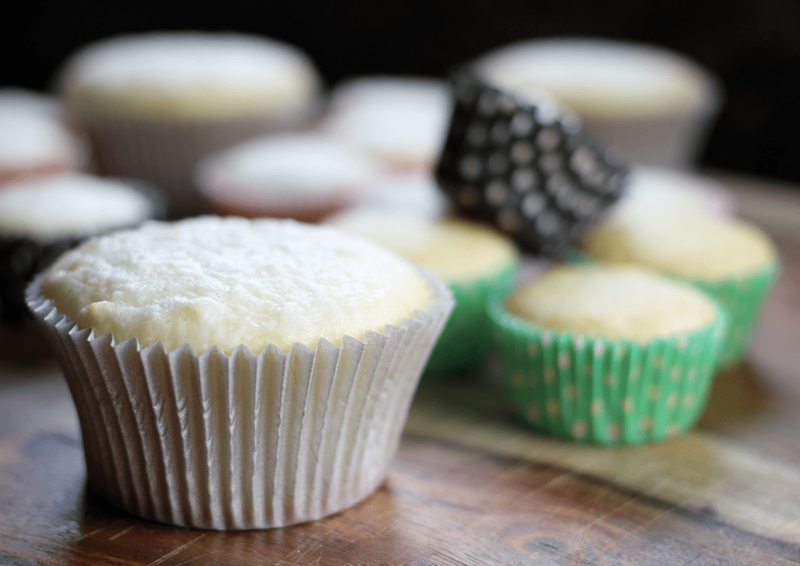 If you’re like me and can’t decide if you want minis or regular size cupcakes, bake both! I’m terrible at making decisions. This is super duper easy. First, fill a small bowl with any color of sprinkles you want. Then, using sharp kitchen shears, cut the mini marshmallows in half at an angle – from top corner, to opposite bottom corner. The center part that was just cut will be super sticky. Press the sticky halves into your bowl of sprinkles and the sprinkles will stick right to the marshmallow. You can make your own frosting or keep on with the store bought theme and go with the canned stuff. Confession: I’m not a fan of canned frosting because it’s sooooo sweet. With just a thin layer, though, it’s actually really good on these coconut cupcakes and makes the perfect “glue” for the marshmallows. 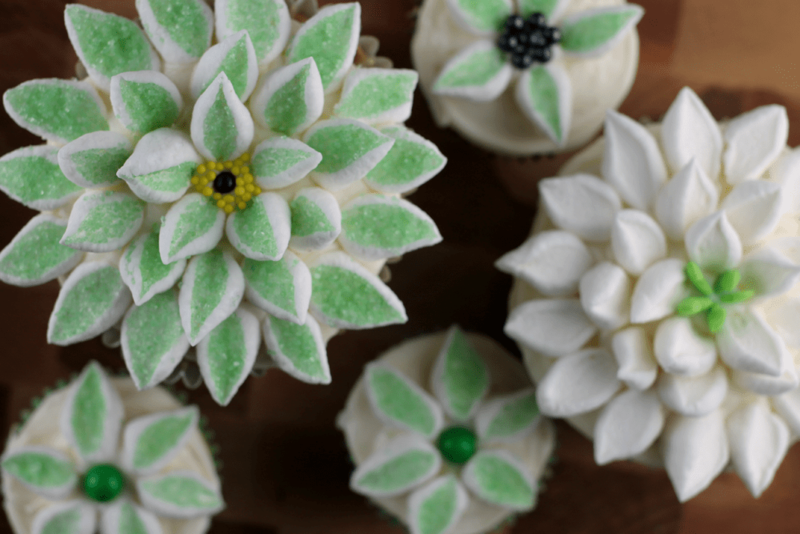 Once a few mini cupcakes were decorated, it was time to go super-sized. What’s better than a mini cupcake topped with three mini marshmallows? Oh yeah, a regular sized cupcake topped with 15 marshmallows. Duh. 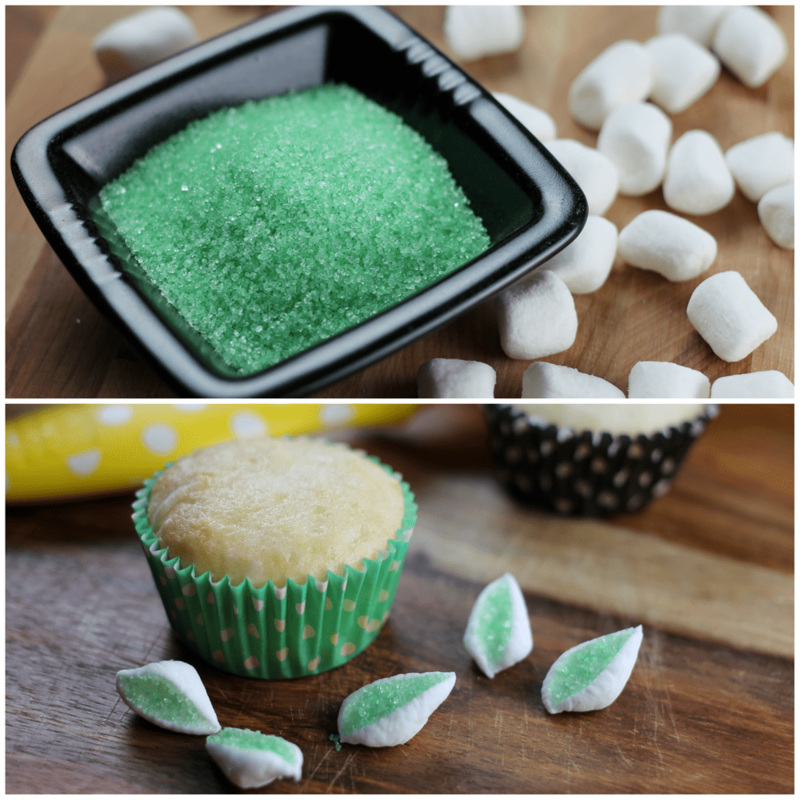 You can even skip the colored sugar altogether and leave the mini marshmallows as plain as can be. Either way, it still looks pretty damn cool, right? Mix the cake mix as directed. Add 3 teaspoons of coconut extract and 1 1/2 cups of sweetened flaked coconut to the mixed cake batter. 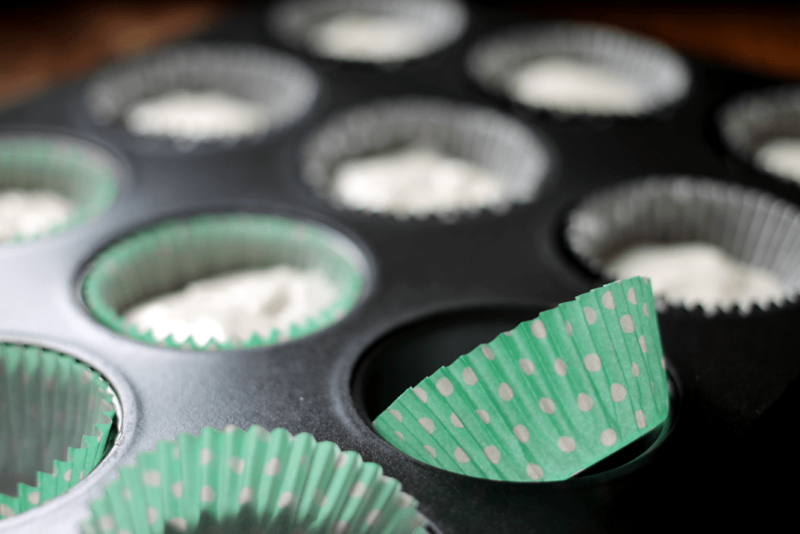 Pour the batter into a lined cupcake pan – regular sized cupcakes or mini cupcakes, depending on preference. Bake cake as directed on the box. Allow the cupcakes to cool completely. Add color sprinkles to a small bowl and set aside. Using sharp kitchen shears, cut the mini marshmallows in half at an angle – from top corner, to opposite bottom corner. The newly exposed center of the marshmallows will be sticky. Dip and lightly press the cut section of the mini marshmallows into the color sprinkles so the sprinkles stick to the marshmallow. 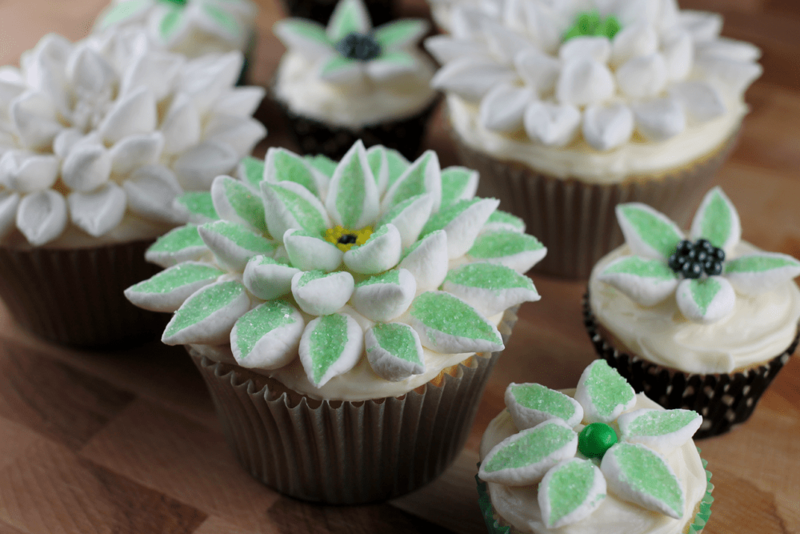 Lightly frost the cooled cupcakes with vanilla frosting. 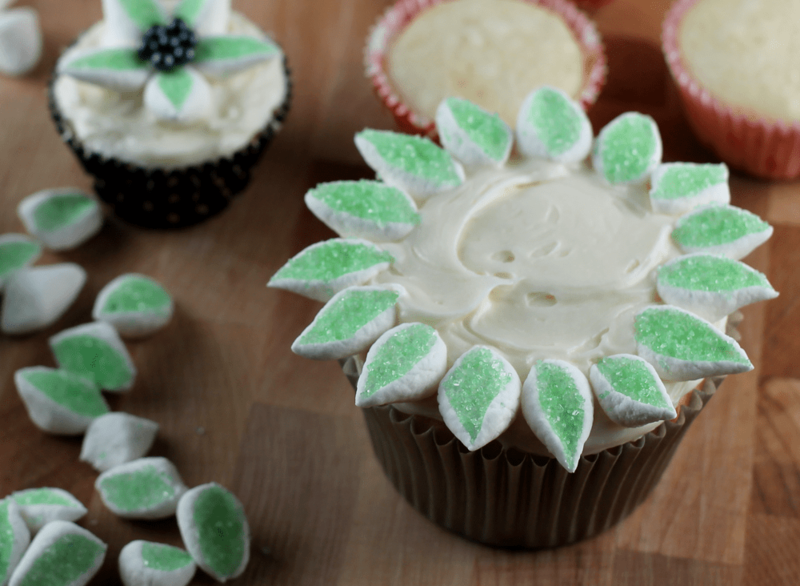 Place the sugar colored marshmallows (aka, flower petals) onto the frosted cupcake to make your flower. Thanks for the tutorial! I’ll use it for a group of 8 & 9 yr. old girls for their activity at church tomorrow.